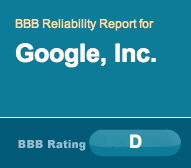 Home > Google News > Does Google Deserve A "D" On Their Better Business Bureau Rating? We have enough concerns about this company (for example, their offer, customer complaints, advertising, etc.) that we recommend caution in doing business with it. How can the BBB caution people conducting business with the largest and most loved search ad company? In the past 36 months there have been a total of 424 complaints. To me, that is a pretty low number based on the number of advertisers and Google users they have. In July, I reported at Search Engine Land that the BBB listed Google as unsatisfactory. In any event, does Google deserve a D or unsatisfactory rating? I agree with you about the scammers, affiliates etc. but -BBB D rating or not- the real issue is that AdWords support is mostly an euphemism even for honest advertisers. Misleading messages in AdWords interface, no phone support, loops and dead-ends when someone tries to contact support. Is that the customer support one would expect from a multi-billion -"do no evil"- company? Google is getting sclerotic and you need to be nimble in business. Just my 2 cents. I'm astonished, after all the stuff you've replied to, that you give this any credibility. There's *two* issues (CC denials, and account review speed) that are showing up as a pattern here, and *one* significant cause of increased activity - more newbie affiliates than I can recall seeing in around five years of activity on this forum. So what do you think? Does Google deserve this rating?